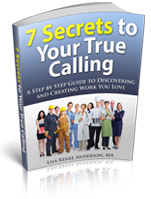 Whether you are sick of your job, looking for another job or considering retirement these coaching articles will be helpful in moving you that much closer toYour True Calling. Is there an article that you would like to see written about a career coaching or life coaching topic of your choice? Let me know. These coaching videos include practical and hands-on exercises that move you closer to Your True Calling. Be sure to have paper and pen handy before you get started. Is there a video that you would like to see about a career coaching or life coaching topic of your choice? Let me know. Lisa was a great mentor and confidant for discussion, thought and insight. She helped push me to areas not thought of before. As well was helped me with overall confidence and energy. Great job and will continue to reach out to her as my new position progresses. New friend for life!! -Dan B.